The Learning Diversity blog has now been online for several years. We continue to reach a diverse readership, including secondary school educators, college faculty, parents, nonprofit organizations, and, of course, students. 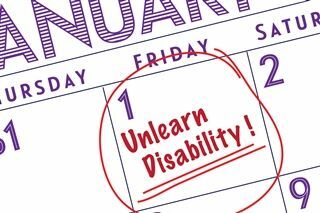 It being January, and being the new editor of Learning Diversity, I am making my New Year’s resolution to renew my commitment to unlearning disability and, in its place, relearning learning diversity. I would like to urge you to make or renew the same commitment. The idea of unlearning is making its way across academic disciplines (see Baines 2014), positively affecting teachers and students and their interactions with one another concerning issues of social justice. Unlearning began in organizational communication, and that is still where the most interesting research on the subjects is being done. Brian Hedberg (1981) argues that unlearning is the conscious discarding of obsolete memories, maintaining that “the acquisition of new practices is often obstructed by the persisting knowledge of past practices” and that “old practices need to be unlearned to create a space in the individual’s memory for new practices to adhere” (p. 18). John Newstrom (1983) defines unlearning as “the process of reducing or eliminating pre-existing knowledge or habits that would otherwise represent formidable barriers to new learning” (p. 36). Paul Nystrom and William Starbuck (1984) define unlearning as a process of “discovering the inadequacies of old ideas and discarding them” (p. 53). Nystrom and Starbuck identify the individual’s unlearning process as requiring humility, objectivity, and the self-confidence to face errors; an organization’s unlearning process requires a manager or leader’s entertaining dissent and fostering a culture of experimentation. Juan Gabriel Cegarra-Navarro and Beatrice Moya (2005) focus specifically on individual unlearning, arguing that it consists of three phases: recognition of problems, alteration of established cognitive patterns, and development of new assessment frameworks to be used in the future. Njoke Thomas (2011) considers this research and reconceptualizes unlearning for a new generation of learners. She strives for a less literal application of unlearning than her male colleagues and instead redefines it as “a form of learning in which the individual engages in intentional evaluation of the self, task, and environment to determine that a change of practice is necessary and possible.” Many individuals become “stuck due to desensitization to key changes in their environment and therefore, unlearning is contingent on an element of surprise, events that violate expectations” (p. 26). The takeaway from this brief literature review is that unlearning is first and foremost an intellectual and emotional process, not a magical transformation that occurs when we snap our fingers or press a button. It is a process that will require us, as advocates of learning diversity, to surprise and radically but pleasantly violate the expectations of those colleagues, peers, family members, and friends around us who need to unlearn disability along with us. This year, I want us all to recognize the inadequacies of labeling our students and children disabled. I want us all to rediscover our humility and self-confidence to recognize that we, too—teachers and parents—are also unique individuals and learn differently than our colleagues. It is this uniqueness of each one of us that collectively makes us a great department, school, and community. We need to recognize that it is easier to label a student disabled or abnormal and set her aside than remove each student’s label and teach each student according to how she learns best. When we take that step to unlearn disability and relearn in its place learning diversity, we are taking on more work in and often outside of the classroom, but it is that complex work that will bring great rewards to our students and children, and, in turn, to us. When you and your colleagues and families begin relearning—embracing—learning diversity, you are opening up the space and people around you to teaching and learning possibilities that were before unknown and unfelt. A question that I am always posing to myself is what are the best, most innovative ways to inspire myself and my colleagues to unlearn disability and, at the same time, practice pedagogies and create projects that are accessible to students of all abilities, focusing on students’ individual strengths, skills, and talents? As a writing teacher, one answer to that question is to privilege a studio approach to teaching and learning. A studio approach respects that learning contexts vary from classroom to classroom. In addition, a studio approach acknowledges the centralized role of students and teachers as co-facilitators in learning. A studio approach also emphasizes the complexity of these activities and the productive variations in learning preferences. Several established, even famous, philosophers and practitioners across professional disciplines have also advocated for what we now call studio approaches to education, including H. Boyd Bode (1938), John Dewey (1902), Caroline Platt (1948), Maria Montessori (1949), Ken Robinson (2011; 2015), Juhani Pallasmaa (1996; 2010), and Sherry Turkle (2012). These educators and philosophers established the need for a space that emphasized creativity, spatial awareness, collaboration, and play. The studio approach I and several of my colleagues emphasize in our classrooms to surprise and even violate our students’ expectations about what teaching and learning looks, sounds, and feels like, emphasizes collaboration and conversation, access to a variety of meaning-making tools, convergent (concrete) and divergent (abstract) thinking, and an awareness of the effects a space has on teaching and learning. What makes our studio approach work is that we, the faculty at the school, including everyone from the headmaster to the men and women who keep our school clean and all of us well fed—do what we do from the premise that learning differently means teaching differently. We teach differently than other schools because we consider the whole student—intellectually, socially, and emotionally. If teachers want to unlearn disability, changing the culture at their schools, they must begin thinking about their students as whole persons. I recognize happily that not every reader of Learning Diversity is a writing teacher. Some of you are not classroom teachers at all but are parents and community members. However, I believe these approaches benefit our students in any classroom and at home, too. Using the studio approach to teaching and learning, I would like to propose some strategies to engage us all in unlearning disability and embracing learning diversity this year. These strategies do not cost money or take a lot of time to implement into our daily teaching/learning/living routines. These strategies will take our students and children by surprise and they could even pleasantly violate their and our own expectations. Converse with your students/children. Take time in class or at the dining room table to get to know them, their interests, their likes and dislikes, and their learning approaches. And, collaborate with them to create the objectives for the course and the rules for the classroom/home. Remember that you do not lose control by collaborating with your students/children; instead, you create together a mutual understanding and respect. Provide your students/children access to a variety of meaning-making tools. People of all ages need to be able to explore making meaning through a variety of tools and modalities. Some people are visual learners, while others are auditory. Still others are kinesthetic learners, and yes, some people even learn best in traditional reading/writing situations. I have a technology-rich classroom where students have access to video recorders, mics, and cameras, as well as to more traditional composing tools such as markers and construction paper and rulers. I also have no objection of turning my classroom into a stage and having students act out whatever is on the agenda for the day. A teacher does not need a technology-rich environment to provide her students access to the tools and modalities with which students might learn best. Afford your students opportunities to sketch out their ideas on paper or screen; afford your students opportunities to incorporate sound and images into their projects; and afford your students opportunities to make meaning with their bodies. You will not regret privileging multimodal thinking and making alongside our traditional print pedagogies and projects. Respect students and children who are convergent or divergent thinkers. Our student body is comprised of convergent and divergent thinkers, and all thinkers need to be afforded opportunities to share their ideas. Convergent thinking is oriented toward deriving the single best or most correct answer, while divergent thinking involves producing multiple or alternative answers from available information. Students need to learn both divergent and convergent thinking because, jointly, these skills help students create productions that are both effective and novel. Arthur Cropley (2006) argues the need for applying divergent and convergent thinking to the creative process, and, in fact, argues that not applying both is risky and will ultimately not get the outcome for which one is hoping. Consider the importance of space in relation to learning and living. When we consider space, we are not only considering how to arrange our classrooms or how to arrange our homes. Instead, we are considering how students and our children interact within a learning environment; ways in which teachers and parents organize learning elements and resources; relationships between text, learning resources, materials, and activity; and designs of engaging learning settings. This year, when you consider space as one aspect of the teaching/learning and living environment, you might ask: How does my current space reflect a democratic learning environment? What challenges might my students or children face in the ways in which space is designed? What opportunities exist to adjust the learning space to reflect the ways in which all students and children can think differently about learning and living in a community? I hope that in this inaugural post I have provided you four approaches that you can use to begin your year of unlearning disability and relearning learning diversity in your classrooms and in your homes. Of course, I will keep you posted regularly this year about how I am faring in my New Year’s resolution to recommit myself to learning diversity. I hope that you, too, will let me know how you are doing and what you are doing in your own classrooms and homes to embrace learning diversity. Baines, AnnMarie D. 2014. (Un)Learning Disability: Recognizing and Changing Restrictive Views of Student Ability. New York: Teachers College Press. Bode, H. Boyd. 1938. Progressive Education at the Crossroads. New York: Newson & Co.
Cegarra-Navarro, Juan Gabriel, and Beatriz Rodrigo-Moya. 2005. Business Performance Management and Unlearning Process. Knowledge and Process Management 12.3: 161–70. Cropley, Arthur. 2006. In Praise of Convergent Thinking. Creativity Research Journal 18.3: 391-404. Dewey, John. 1902. The School and Society. Chicago: University of Chicago Press. Hedberg, Brian. 1981. How Organizations Learn and Unlearn. Handbook of Organizational Design. Eds. Paul Nystrom and William H. Starbuck. London: Cambridge UP. Montessori, Maria. 1995. The Absorbent Mind. New York: Henry Holt. Newstrom, John W. 1983. The Management of Unlearning: Exploding the Clean Slate Fallacy. Training and Development Journal 37.8: 36-39. Nystrom, Paul, and William H. Starbuck. 1984. To Avoid Organization Crisis, Unlearn. Organization Dynamics 12.4: 53-65. Pallasmaa, Juhani. 1996. The Eyes of the Skin: Architecture and the Senses. London: Academy Group, LTD.
Pallasmaa, Juhani. 2010. “Allowing Children to Be Rooted in Real Life.” Ed. Cannon Design. Platt, Caroline. 1948. I Learn from Children. New York: Grove Press. Robinson, Ken. 2011. Out of Our Minds. West Sussex: Capstone Publishing. Robinson, Ken. 2015. Creative Schools: The Grassroots Education That’s Transforming Education. New York: Penguin. Thomas, Njoke. 2011. Towards a New Definition of Unlearning: Rethinking Individual Level Unlearning and Its Implications for Practice Change (Master’s thesis). Case Western Reserve University. Cleveland, OH. WP-11-01.